OLYMPIC MEDALIST. PAN AM GAMES GOLD MEDALIST. WORLD CUP PARTICIPANT. Kaylyn, a native of Saskatoon, Saskatchewan really has the sport genes in her family as her father Doug played major junior and played for three seasons in the International Hockey League which was the top tier below the National Hockey League. Doug retired and a little over a year later, Kaylyn was born. Early in her childhood, she started out as a goalie, but eventually made the change to midfielder. At the age of 14, Kaylyn was spotted by Canada Soccer scouts and invited to try out for the national youth program. While she continued to play in the province, she made her debut in 2003 participating in at the U-16 camp. Her success led her to being invited subsequently to U-17 & U-20 camps for the next 3 years and she made her debut in the CONCACAF Women’s Under 20 Championship at the age of 17 winning a Silver Medal in 2006. With this finish, Canada qualified for the FIFA U-20 Women’s World Cup in 2006. Since this point, Kaylyn has been a steady presence in the Canadian lineup through her hard work and desire to be the best at midfield. In 2011, she was rewarded with her first opportunity to compete at the FIFA Women’s World Cup. While the results here was not what Canada had been striving for, Gold was found at the XVI Pan American Games which reset the confidence for Canada into the CONCACAF Women’s Olympic qualifying event played in Vancouver with the top 2 teams going to London. Canada was able to make it to the finals & thus qualify for the Summer Games. Canada’s draw was not an easy one playing 2011 World Cup Champion Japan, South Africa & Sweden in the prelims, but the magic really began with a victory over Great Britain in the quarterfinals and a game that will be talked about for decades a controversial 4-3 overtime defeat by the United States in the semis. The loss to the US was devastating, the Bronze medal match against France had the chance for redemption and bring home Canada’s first team sport summer medal since 1936. The resolve of Canada to not allow this opportunity go by was capitalized on with a goal in the 92 minute to bring home a 1-0 victory. While not the medal that the team wanted, the finish was. Securing the Bronze medal has become a great rallying cry to where Kaylyn and her teammates want to go and that is to win on home soil and capture the nation’s first FIFA Women’s World Cup which will be hosted in 2015. Support in Canada should rival that of what was seen in the 2010 Vancouver Winter Olympic Games. In the winter of 2013, she was selected by the Seattle Reign FC in the newly formed National Women’s Soccer League that will be operated by USA Soccer while the Canadian and Mexican soccer federations will supplement the salaries of their national team athletes in the league. In Seattle, Kaylyn joined a team with Canadian national teammate Emily Zurrer, Americans Hope Solo & Megan Rapinoe as well as Mexicans Jenny Ruiz and Teresa Noyola. At the conclusion of the inaugural NWSL campaign, Kaylyn played in 21 of 22 games for Seattle, starting in 19 of them. She had 3 goals with 1 being a Game Winning Goal. Additionally, she was 4th on the team in minutes played during the season with 1752 minutes. The three players ahead of her, started at least 21 of the 22 league games. During the NWSL season, due to injuries suffered by Seattle, Kaylyn was asked to play Center Back as opposed to her more familiar Midfielder role for the team. In September 2013, Kaylyn was traded to the Boston Breakers where she will played the first 3 games of the 2014 season and was acquired by the Houston Dash for Nikki Washington, April 29, 2014. During the off-season of 2015, Kaylyn was acquired by the Portland Thorns FC. Kaylyn on the attack vs Portland with Christine Sinclair of Canada Soccer chasing her. The NWSL was formed to give the best North American players an opportunity to play at home, grow the game and have momentum for all the sides in advance of the 2015 FIFA Women’s World Cup. Kaylyn was named to the 2015 FIFA Women's World Cup squad by Canada in April 2015. 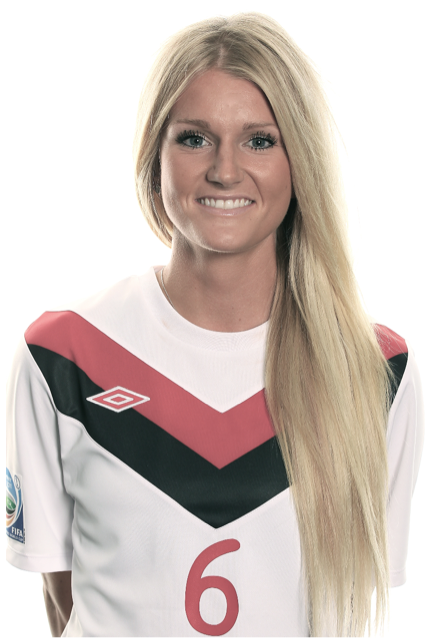 Kaylyn to date has 101 international appearances & 61 starts for Canada. During the 2015 FIFA Women's World Cup, Kaylyn came of the bench the first two games of the tournament and made a start in the last game of the group stage. Kaylyn's 100th cap came in the Round of 16 in a victory over Switzerland at BC Place. Kaylyn along with U.S. forward Alex Morgan were acquired by the Orlando Pride (NWSL Expansion Team for 2016) in a trade with the Portland Thorns in October of 2015. Off the pitch, she has been an active supporter in breast cancer awareness via a former partner, also active in support of Saskatchewan agriculture products and is a global athlete ambassador for Right To Play where she has made an athlete visit to the West African nation of Liberia to help make a difference. During the 2015 FIFA Women's World Cup, Kaylyn became an advocate of FIFA's #LiveYourGoals program. Kaylyn along with her sister Courtnee have put on the KaylynKyleSoccer.com academy in the Fall of 2015 in her home province of Saskatchewan and will now put on other soccer camps throughout Canada. One component of these camps is to give the opportunity for under served kids who cannot afford to be able to attend a camp like this and give them entry via a personal scholarship and corporate partners. She will put on her next camp in Aurora, ON in November 2015 and will add additional locations once the Canada Soccer schedule is finalize ahead of Olympic qualification that will take place in Dallas, TX in Spring 2016. During the off-season she splits her time in Saskatoon, in Mexico and Southern California with her boyfriend Gabriel who is a professional soccer player in the Mexican League and former member of MLS' Chivas USA. Additionally, she makes various speeches and public appearances throughout North America. Kaylyn added a corporate endorsement with BAUSCH + LOMB CANADA in July 2013 and is a part of the Holiday (December) 2013-14, Beats by Dre Color Solo Campaign and in the fall of 2015 will be a part of a Canada Soccer / sponsored Skills Video series that will be seen online. Kaylyn signed endorsement deals with Under Armour and Golazo Beverage Company in 2015. She can be seen in a Canadian national campaign #EarnYourArmour with retailer SPORTChek that will run through the summer of 2015. These two along with Beats by Dre are Kaylyn's corporate partners as of Summer 2015. Today, Kaylyn has a partnership with Alcon Canada for their contact lenses products with a campaign that will launch November 2015. For Kaylyn, Social Media is a component that she has embraced wholeheartedly. As it relates to Canadian amateur sport athletes, she has a large following that has a total net of over 100k across Instagram, Twitter and Facebook Pages. She understands that you need to be able to give folks a glimpse of your life and what goes into not only being an athlete but her personality. Kaylyn’s motto which is very dear to her is Dream.Laugh.Family. With all 3 of these elements she knows where she is headed and what is important to her. Part of the 2013 Sportsnet Magazine Beauty of Sport Issue.